We've Achieved Sophos Platinum Partner Status! 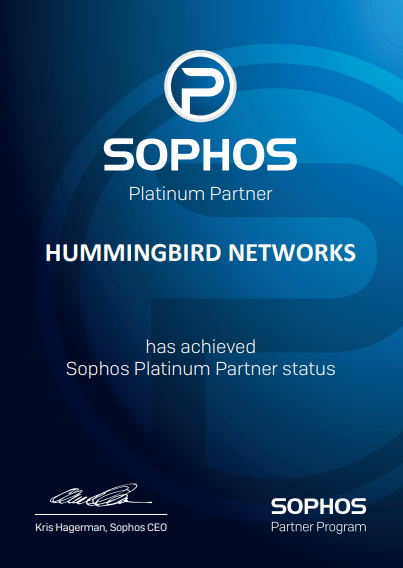 A little over a year ago, Hummingbird Networks announced a partnership with Sophos. Today, we are nestled in the highest partner ranking attainable. The Hummingbird team achieved this ranking by attaining a specified revenue bracket and completing extensive security and licensing training. Hummingbird Networks is proud to sell Sophos' full line of security products. Among other impressive accolades, this innovative brand has been named Leader in Gartner's Magic Quadrant for Endpoint Security Platforms ten consecutive times. Hummingbird Networks’ account managers are well versed in Sophos' entire line of security products, the licensing model and the value that customers can experience from Sophos. Between our account managers' expertise and their premium access to Sophos' engineers, Hummingbird's customers are in good hands. Want to learn more about Sophos? Contact us!